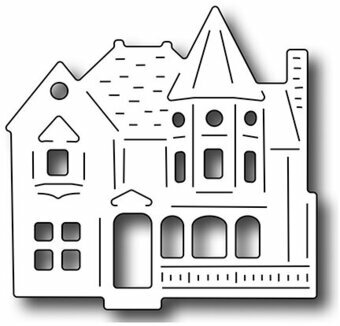 The Village Victorian House measures 1.5" x 1.5". 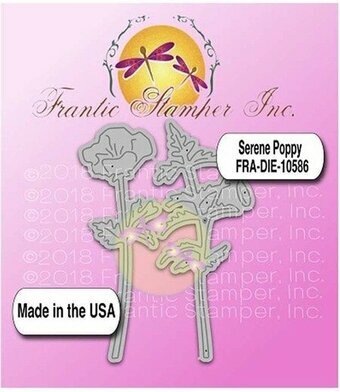 Frantic Stamper Precision Dies are made in the USA. Compatible with all leading consumer die cutting machines. Our Bow Swag die will add a touch of elegance and romance to your projects. The Bow Swag die measures 5.5" x 0.75", so it can be used on both landscape and portrait orientation cards. Our set of two dragonfly dies features optional embossed wing inserts. The dragonflies are gorgeous when cut from shimmering cardstock, or sprayed with a shimmer spray for a translucent look. Approx. sizes: 2.6" x 1.9" and 2.95" x 2.1"
Grace your cards with our beautiful Dogwood Branch die. Perfect for Spring, Mother's Day, Sympathy, or Birthday cards. Approx. size: 2.25" x 3"
This die set consists of 3 dies. You get a strip die containing 5 stars in a tumblin formation, which can be reverse-cut into a card front or panel to give you little windows. Or cut the stars confetti style. Each measures approximately 0.875" and the strip measures 4.8" long. The stars have another smaller star cutout of the center to make your stars 2-tone, or make tiny star confetti. Then, you get two long skinny strip dies, one with a pin dot center, and the other plain. Both strips are 5.25" long x 0.25" wide. The plain strip will is just wide enough to stamp the sentiments from the Sweet Summertime (FRAS108) and Reach for the Stars (FRAS109) stamp sets. With these dies, you can build a USA flag, as well as other fab designs. Let your imagination run wild and see what you come up with! The Flower Basket die is perfect for filling with your favorite flowers for a Mother's Day card, friendship card, or any Spring themed card. Approximate size: 2.25" x 3.5". Our Giant Layered Hello die measures approximately 2.75" x 1.75". The die set comes with the word Hello in a trendy script font, as well as an outline die to easily create the layered look. We love beautiful women, because we are all beautiful!! La Femme is an elegant lady perfect for Mother's Day cards and more. 1.5" x 3.2". 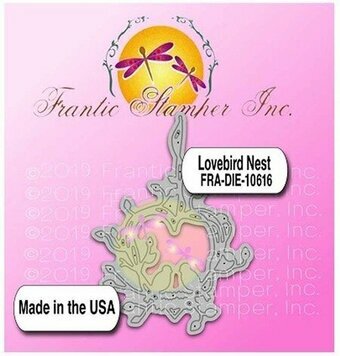 The dainty Lovebird Nest die features two birds inside a heart-shaped vine. Approximate size: 2.55" x 3.55". Our Oriental Tassels are similar to the "Chinese Luck Knot" tassel die (FRA10572) in that they can be used for so many occasions. Approx. sizes: 0.875" x 3.25" and 1.3" x 3"
These stylized Dutch Roses (or Dutch Tulips) are done in a "reverse cut" way, so the design is cut into the card front. Approx. size: 2.45" x 2.95"
The Reverse-Cut Spring Words die set features 5 block words, modeled after old-fashioned dymo tape for a great retro look. Mix and match the words to form simple phrases, such as: Happy Easter, Happy Spring Day, and more. Approximate sizes EASTER: 2.05" x 0.6", SPRING: 2.05" x 0.6", DAY: 1.25" x 0.6". One, Two, Three, meet the sack bunny family! Mom, dad, and baby sack bunnies with their cute heart noses were modeled after bunnies made from burlap sacks. Our dies work on stiffened fabric, so why not cut them from calico fabrics or thin burlap for a fun textured look! Approximate sizes: largest sack bunny: 1.125" x 2.375", smallest sack bunny 0.9" x 1.75". Always so delicate, the poppy flower comes in a variety of colors, from the red poppies of Monet's paintings, to the glorious orange and yellow of the California Poppy. Our Serene Poppy die set comes in 2 parts. In this set, you will have both the single flower stem, and an accompanying leaf stem with a bud to create your arrangements to your liking. Approximate sizes: 1.2" x 3.4" and 1.4" x 3.5". The Side View Butterfly die depicts an elegant Monarch butterfly in flight. 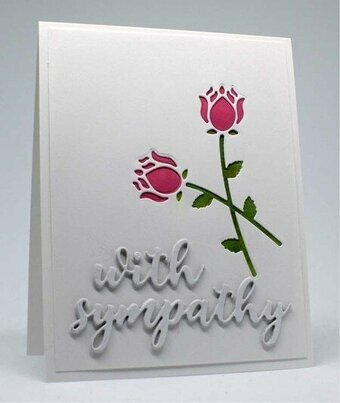 Rest him on a flower, or add him as a simple adornment to a simple card for a soft touch. Our intricate detail cut lines make it a snap to trim the body off of the wings, or to use as a coloring guide. 1.625" x 2". This modern take on a stained glass window brings stlying to your faith-based Easter cards. 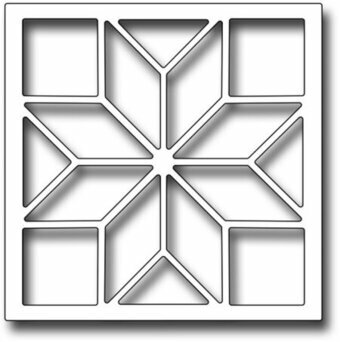 The Stained Glass Cross design can be used in many ways: Try the inlay method. Cut the die with black cardstock and save the "lead" portions of the design. Cut the die again using different colors of vellum or metallic paper, and inlay the pieces into the "glass" pieces. Easy Window look. Cut the die in black cardstock and mount the design over acetate or a pre-made inked background. Approximate size: 2.5" x 4". A simple but elegant stained glass look, measuring 2.25" x 2.25". 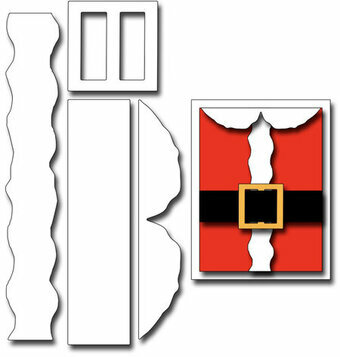 The die allows you to cut and piece back the design in an inlay technique, or cut from plain cardstock and overlay on top of acetate or vellum for a window style look. This star quilt design lends itself to year-round cards simply by the colors you choose. Our Stitched Diamond Panel #1 layers beautifully with our Stitched Diamond Panel #2 (FRA10602) for a wonderful layered effect. You'll definitely want both dies!!! Approximate size: 3.75" x 5", which leaves you with a nice 1/4" border all around a standard A2 size card front. Our Stitched Diamond Panel #2 layers beautifully with our Stitched Diamond Panel #1 (FRA10601) for a wonderful layered effect. You'll definitely want both dies!!! Approximate size: 3.75" x 5", which leaves you with a nice 1/4" border all around a standard A2 size card front. Straight from South America, Tomas the Toucan is ready for your bright colors to help you wish your friends a great bird-day. Tomas measures 1.625" x 3.25" and includes a branch to sit on. 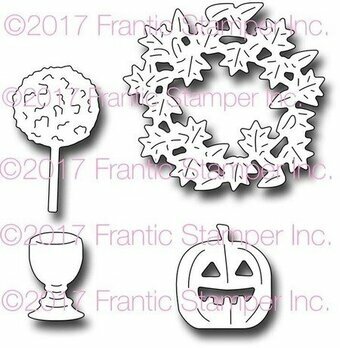 Frantic Stamper Precision Die - Winter Village. This one piece Winter Village die measures 5.125" x 2.75". 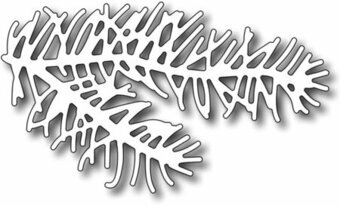 This detailed die will create a fast winter scene for a quick card. 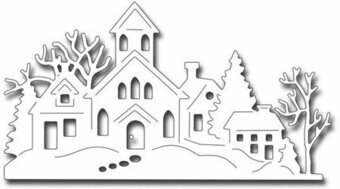 Add as much detail as you want to embellish the die cut: color the houses and trees, add glitter or snow texture to the snow and roofs, or custom snip elements to add dimension. The choice is yours on how much detail you want to add! Oh, and let's not forget that the little doors and windows cut out.... so you can either replace the pieces back for a tone-on-tone look, or color them and place them back in, or mount the die over patterned paper that will peek through the windows! 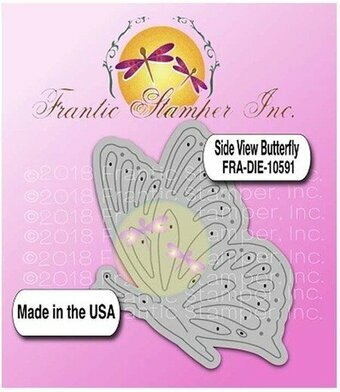 Our Frantic Stamper Precision Dies work in most consumer table top die cutting machines such as the PressBoss, Cuttlebug, Big Shot, vagabond, Boss Cut, and Grand Calibur. Some dies may require the use of a metal shim depending on your machine. This set of 2 dies includes a table measuring 1.25" x 1.375" and matching chair measuring 0.675" x 1.7". 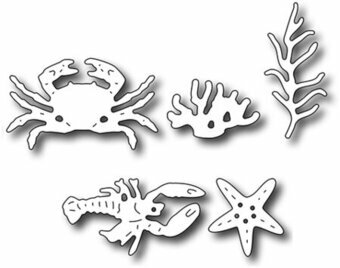 This set of 4 dies includes 2 scalloped corner dies and 2 inserts. Cut only the corners, or add the design inserts for a lacy corner. 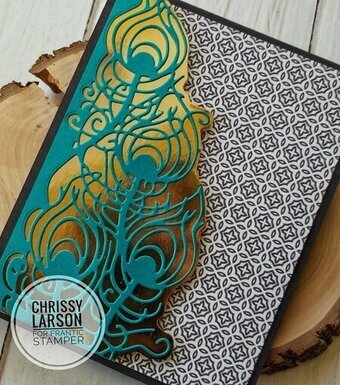 Additionally, you can cut the design inserts only into your card front for a lace corner look. Approximate size of corners: 1.8" x 1.8" each. 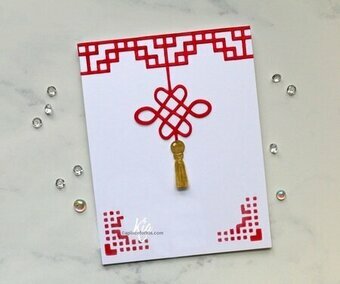 The traditional Chinese Good Luck knot tassel is used for so many celebrations from birthdays to Chinese lunar new year. You will often find them at weddings, in houses and in places of business to invite good fortune. This makes this die so versatile as it can be used to create "good luck" cards for any occasion! Approx. 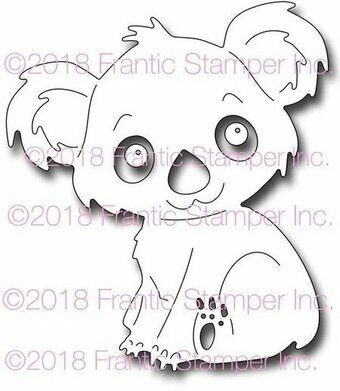 size: 1.9" x 3"
The Giant Layered Happy die works with our "Giant Happy" clear stamp set (FRA-CL-120) to give you tons of sentiment possibilities. The outer die matches both the inner "happy" word die, and the "happy" stamp from the stamp set. Approx. 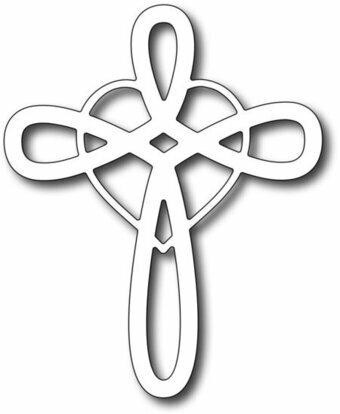 sizes: Happy word die: 3.05" x 1.55" Outer layer: 3.3" x 1.75"
This lovely cross features a heart entwined within the design. It measures 2.45" x 3". Our friends in the Southern States will probably enjoy this die a little more than our Northern pals, but who doesn't want to shout "Hey Y'All" when they play with this fun banyard die release? The word "Hey" measures 1.5" x 1" and "Y'all" meaures 1.55" x 1". Our layered word dies are a real hit, so we had to add this Easter Blessings set. Approximate sizes Easter: 2.5" x 0.8", Blessings: 3" x 0.9". Our gorgeous Peacock Feather Panel Edger will create a beautiful detailed card front with a fussy cut edge. Approx. size: 2.7" x 5.5"